The 100th anniversary of the birth of composer Benjamin Britten is being marked this month. Britten’s contribution to the Anglican choral tradition shows astonishing variety and originality, as was his gift for choosing imaginative and inherently musical texts such as Rejoice in the Lamb and the Antiphon.However, his masterly word-setting is at its best in familiar texts such as the two settings of the Te Deum and the Jubilate. 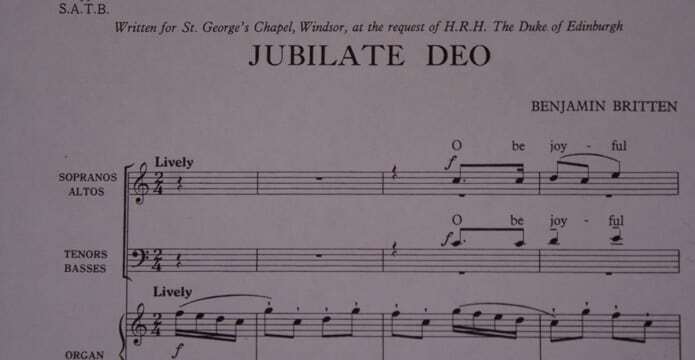 The Jubilate Deo (in C; 1961) was written ‘for St George’s Chapel, Windsor at the request of HRH The Duke of Edinburgh’. This joyous setting, with its sparkling organ accompaniment and energetic choral writing, has become a staple of cathedrals and churches. Music at Mattins in St George’s Chapel on Sunday 24 November will, in particular, mark the anniversary. Next PostNext A link with the past….